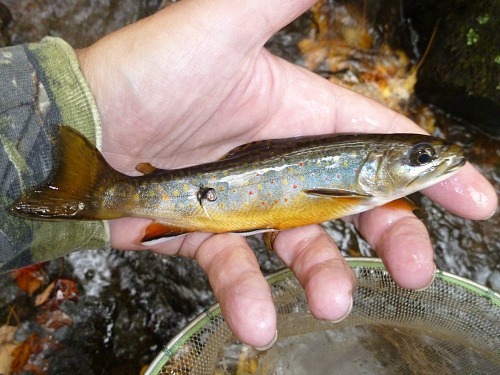 On Sunday I fished two New Jersey streams - one for wild browns, the other for wild brookies. I fished with the Suntech Kurenai HM30R, HM33R and HM39R, depending on how open or overgrown the particular spot was. What wonderful rods! If you don't need big fish capability, and don't fish weighted flies, these three are the only rods you need. By now, I have fished with a lot of rods. Long rods, short rods, big fish rods, small fish rods, many of my competitors' rods. Of all the rods, if I was planning to fish unweighted flies on a small stream, where I expected to catch fish under 10", with the possibility of a 12 incher here and there, I would fish a seiryu rod. They are incredibly light, they are incredibly sensitive, they'll cast a very light line. I suppose I should say that even though the Suntech Kurenai rods I was using are seiryu rods, I was not seiryu fishing. I was tenkara fishing - fishing a single unweighted wet fly and using the long rod and light line to keep the line off the water's surface. In Japan, seiryu fishing is generally done with a small float and bait, but do not for a minute believe that seiryu rods cannot be used for tenkara fishing. I firmly believe they are better at it than nearly all the tenkara rods available in the US - mostly because they are so good at casting light lines. On Sunday, I started out the day fishing a size 2 line but it wasn't long before I switched to a 1.5. Those of you who have never fished with a line lighter than a 4 would be amazed at how easy it is to hold off the water's surface, and how sensitive it is to the subtlest take. Those of you who have never fished with anything but a furled line probably just wouldn't believe it. 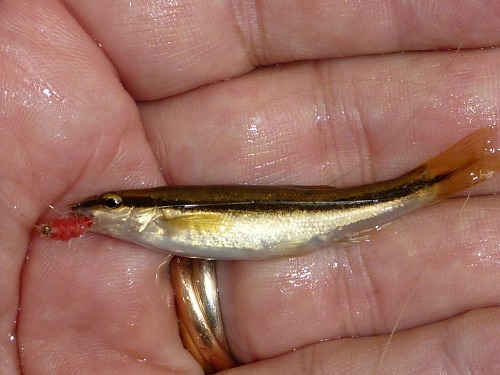 I know that few tenkara fishermen share my interest in micro fishing, but at least consider this: a size 1.5 line is light enough and sensitive enough to register the strike when a blacknose dace hits your Killer Bug! 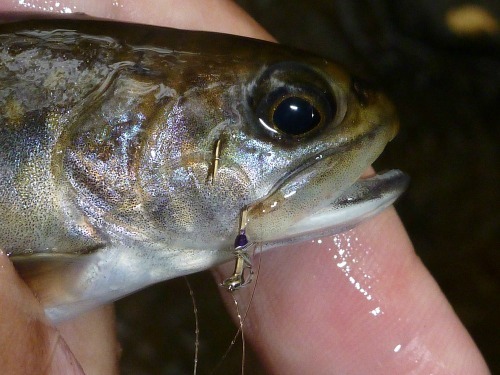 There is little chance that a trout could take your fly without you knowing it. There's only one problem. I can't get any Hi-Vis size 1.5 or even size 2 line to offer. 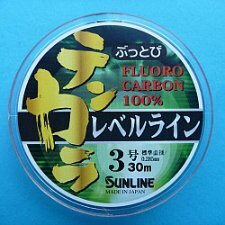 I cannot find Hi-Vis fluorocarbon larger than 1.2 and smaller than 3. I've only fished with size 1.2 line once, and although it was a successful day, that line probably really is a bit too light. Until I can find a lighter line to offer, I will continue to recommend size 3 line. Even with a size 3 line, the Kurenai rods are wonderful, sensitive rods. The day started out with a fallfish, which isn't at all unusual on that stream, but I soon started catching some trout. The fly of the day was a much smaller Killer Bug than I normally fish (size 18 Daiichi 1560) tied with Sunglow yarn, which looks pink when dry but almost red when wet. This is one of the few streams I've fished where the regular Killer Bugs have not been that effective. 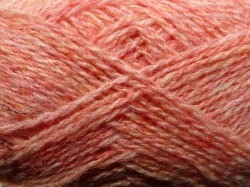 The smaller, pinker Killer Bugs worked surprisingly well, though. We then went to a different stream to fish for some wild brookies. As seems to happen a lot (at least for me) the first fish was not one that I was fishing for. 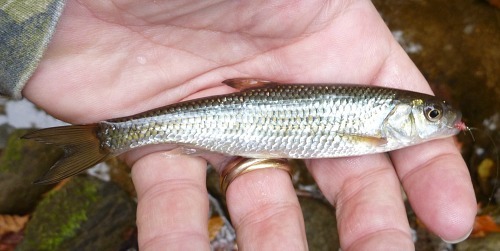 This little creek chub took a CDC & Elk on the second or third cast. It wasn't very long before I started catching brookies, though. The first two were on Stewart Black Spiders (basically just starling hackle on a hook). The hackle is so soft that these flies are not pulsed. Fish them dead drift. Stewart Spider resting on brookie (fish was not foul hooked). When I started fishing the second stream, which is much narrower and more overgrown, I initially used a Nissin Air Stage 240 but the water was low enough and clear enough that the rod was a bit short for the conditions. I switched to a Kurenai HM30R but kept the same line as I'd started with on the Air Stage 240, which was a size 2 line equal to the 240's length. That made it almost 2 feet shorter than the HM30R. After a few casts to get used to the line/rod combination, I decided the size 2 made too much disturbance when it hit the water. I put on a size 1.5 line of the same length (about 2 feet shorter than the rod), to which I added just under 3' of tippet. The short, light line proved to work very well. 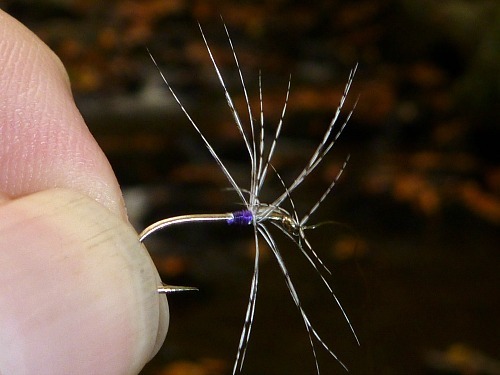 There is a lot of talk in fly fishing circles about overlining a small stream rod because the short length of line doesn't properly load the rod. Do not fall into that trap with tenkara rods - and definitely not with seiryu rods. You do not need to go to a heavier line if you fish a short line. The line has so little mass that you are not loading the rod anyway. 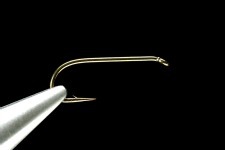 The rod's own inertia provides all the loading that is necessary. Actually, the main limitation on how light a line you can use is wind resistance. A shorter line is not affected by wind resistance as much as a longer line is, so for a shorter line you can actually go lighter. But do try short lines! They are particularly beneficial on smaller streams where your targets are small, the microcurrents are complex and the drifts will be short anyway. I just got an email this morning from a guy who tried a shorter line and exclaimed that it "made all the difference in the world." After the first two brookies, I started switching flies to other soft hackles - not trying to match the nonexistent hatch or to try to find a fly that worked (I already had one that obviously worked) but to see what else would work - even to see how unusual a fly I could tie on and still catch fish. Years ago I was almost a two fly angler - I fished a Killer Bug or a CDC & Elk more than anything else. I've gotten away from that and I have to say fishing is a lot more interesting for it. I like trying different flies, and I probably change flies more often when I'm having a good day than when I'm not. I just like to experiment. I do like to catch fish, though, particularly brookies. Don't you just love the reds and yellows of autumn in the Northeast?